Oh my gosh, I can hardly believe that it is September already. Where did the summer go? It started out with my two week trip in May. Then there was moving my sister into her new house in June. I spent a lot of time working on my master bedroom makeover in July and August. In between all of that, I worked on this dresser and the summer just flew by. But first, here is the ‘before’ photo. This piece is large and heavy and I didn’t have the manpower to move it out of the workshop for a ‘before’ photo, so you’ll just have to excuse that. I’d also already re-glued and patched some of the chipping veneer on the drawer fronts. 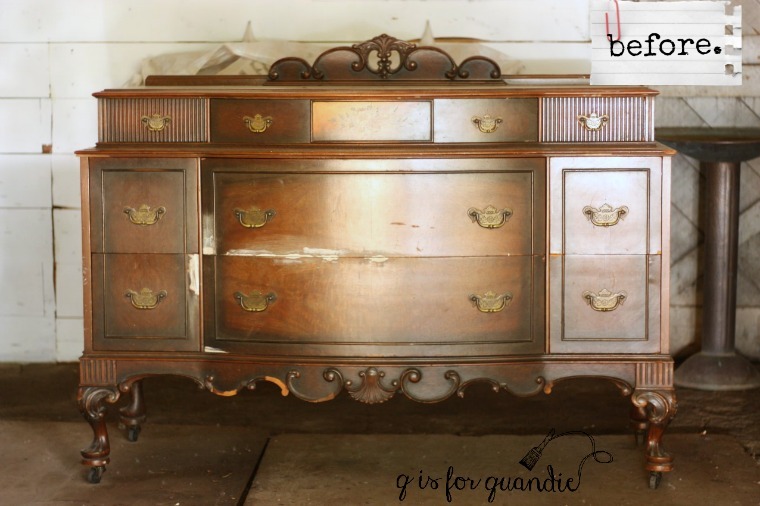 Ken had also already worked some magic on this dresser by re-attaching all four of the feet. Two had come off when we loaded it in the truck, and the other two were pretty wiggly. Ken added dowel pins and fresh glue and now those gorgeous feet will fully support the weight of the dresser. As you can see, I got a lot of chipping on both of these pieces. In fact, I even ended up re-doing the small vanity. I had tried using General Finishes Flat Out Flat as a top coat over the milk paint and I discovered that rather than ‘sealing’ the chipping paint, it brought up more chipping. I did that right before I left on my trip, and the photo above was taken then. When I got back home I found that the finish had chipped even further while I was gone. Basically I’d say about 80% of the paint had completely chipped off. Unfortunately I didn’t think to take a photo of it at that point. To salvage the piece I simply sanded off the chipping paint and then re-painted with the same Homestead House Stone Fence milk paint. This time I added Miss Mustard Seed furniture wax as a topcoat. Here is how it finally looked. The good thing about discovering the propensity towards chipping on these two smaller pieces was that I was forewarned before starting on the large dresser. I wanted some chipping, but I didn’t want to lose 80% of my paint. So I prepped the piece really well by sanding it with 120 grit paper and then cleaning it thoroughly with TSP substitute. That definitely did the trick because I ended up with just a very small amount of chipping on this one. 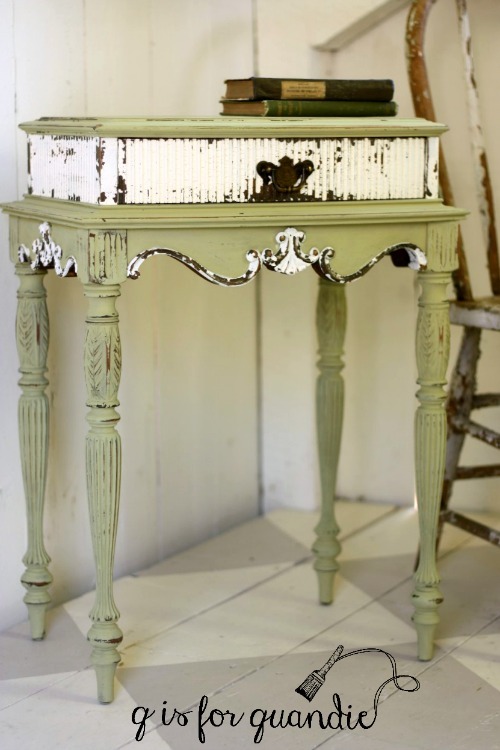 I painted it with Homestead House milk paint in a color called Bedford. This is a lovely greige that is just a tad darker and a tad warmer than the Stone Fence. 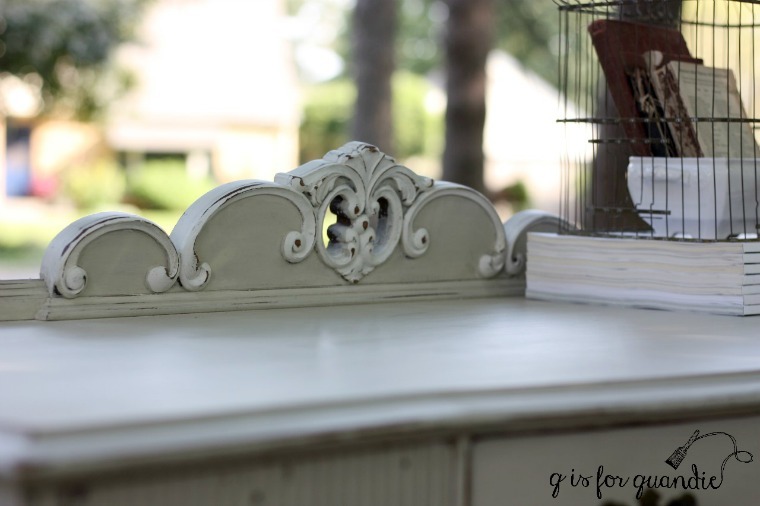 I used another Iron Orchid Designs transfer on the front of the dresser. 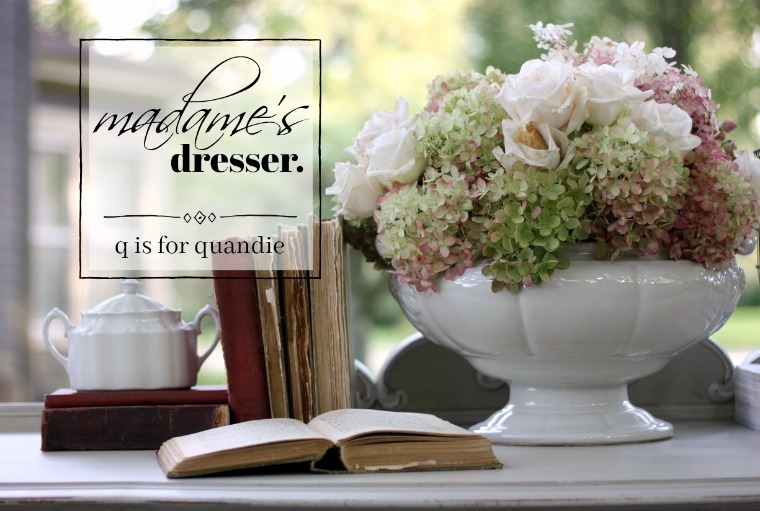 If you look closely at the transfer you can see why I decided to call this madame’s dresser. 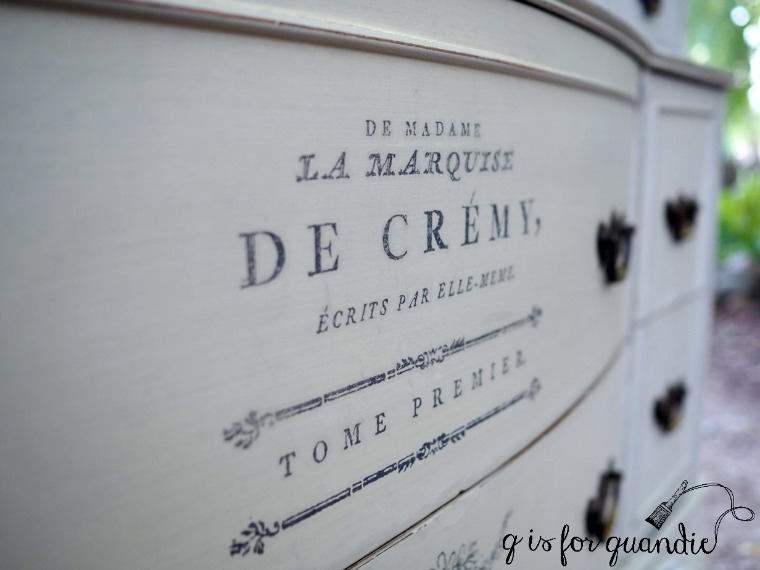 I thought about going with the full ‘dresser de madame la marquise de Cremy’, but that’s really a mouthful! 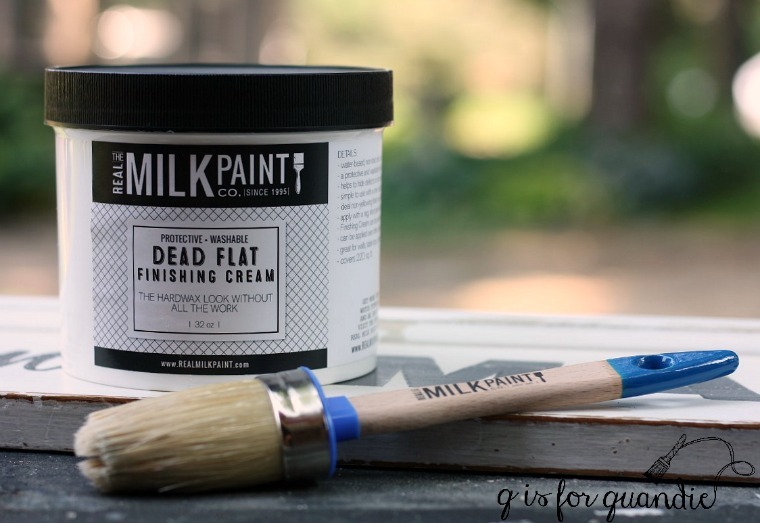 Once again I used the Real Milk Paint Co’s Dead Flat Finishing Cream on this piece. I am really loving this stuff for pieces that I want to sell. It’s nice being able to tell the buyer that the finish is washable. And in fact, I was able to put that to the test on this piece. When Mr. Q helped me move it into place for the photos he left a dirty hand print on top of the dresser. It came right off with a damp cloth. When looking at the ‘before’ photo you might have noticed that some of the trim at the bottom of this dresser was missing. Some people have fancy ways of molding replacement trim out of bondo or some such thing. I prefer to just fake it with paint. I painted the trim with Homestead House Limestone milk paint and I just painted the areas of missing trim as though it was still there. My staging of this piece hid the pretty trim at the back of the dresser top, so I took a quick photo after clearing it off. I didn’t have to fake anything with that bit of trim. It’s all there and isn’t it gorgeous? 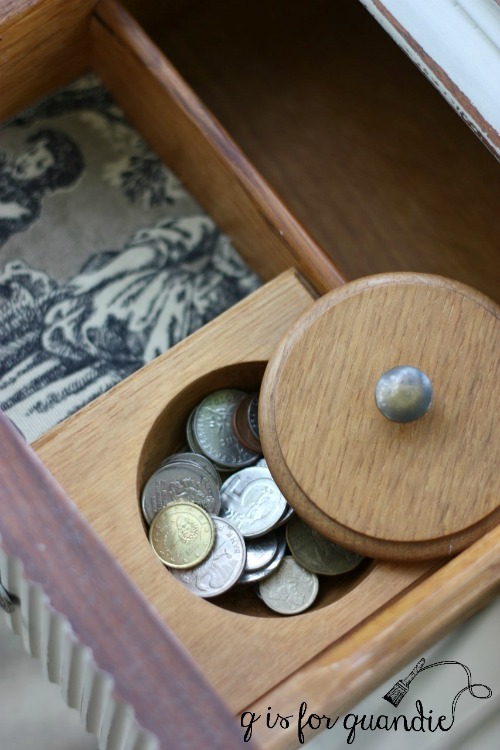 The two little upper side drawers each have fun little coin/jewelry holders inside. There was a velvet liner at either side of them that was pretty grungy though. I thought I’d be able to remove the coin holders, replace the velvet and then put them back in. I also discovered that one can’t get to the screws that hold the pulls in place because the coin holders block them. Much to my surprise the coin holders were not removable. At least not without leaving major damage behind. I had Ken take a look and he thinks they are both nailed and glued into place. So, I improvised. 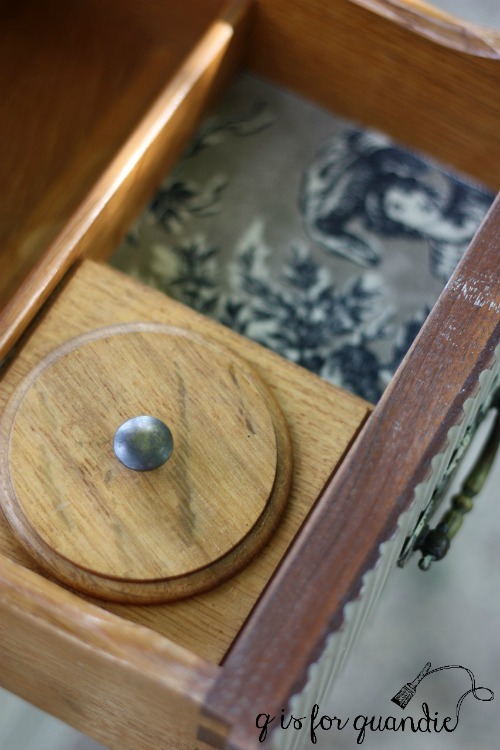 I painted the drawer fronts with the pulls in place and I added fresh toile fabric over the velvet. I used a little 3M spray adhesive to keep the fabric in place. I had fun staging this dresser using old books, some hydrangeas from my garden, some pale roses from the grocery store and some ironstone. We had a gorgeous sunny morning here yesterday so it was perfect for taking photos outside. I may have gotten a little carried away with the quantity of photos, but I couldn’t help myself. There is just something about these beautiful summer mornings in September. They start to feel so fleeting this time of year. This is such a lovely piece of furniture, I’m sure it won’t last long. 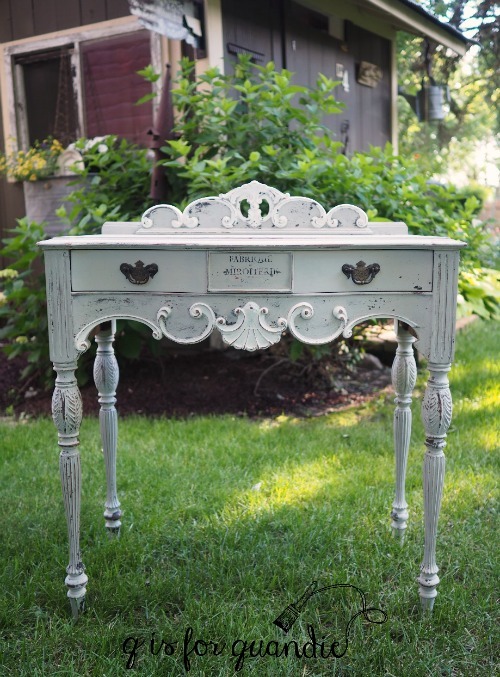 This piece would work beautifully as a sideboard in the dining room or for storing clothing in your bedroom. Be sure to check my ‘available for local sale’ page for more details if you are local and in need of a gorgeous new dresser or sideboard! Previous a heck of a deal. Next union jack with a side of mustard. This piece is perfection! Whoever gets her, they will be truly lucky!!!! 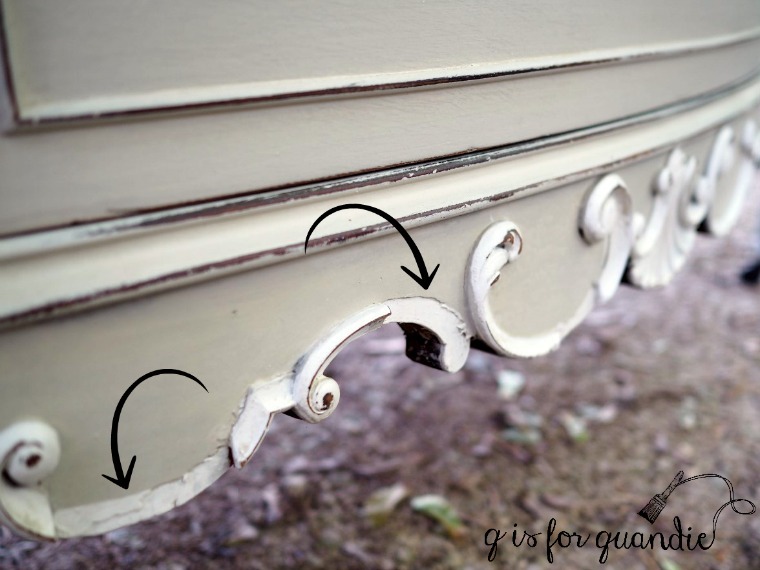 Yeah, that outdated shiny finish was not doing this dresser any favors! Thanks Joni! There was a beautiful warm light yesterday morning, and again this morning and I’m starting to realize it might be due to smoke from wildfires somewhere. Last night the moon was really orange too. But the light certainly made for some lovely photos! Absolutely Gorgeous! Wow what a beautiful piece. I love it. You do such a beautiful job on all the pieces you choose. Your insight and talent is amazing! Dang girl! I wish I lived near you. 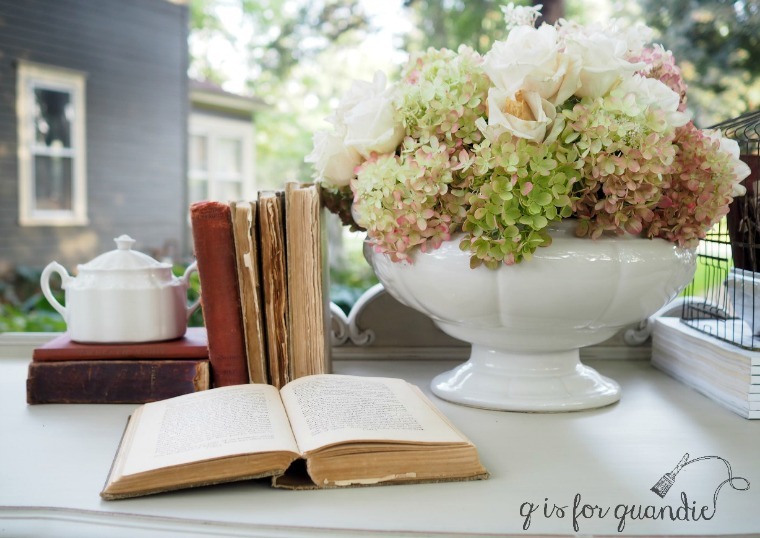 The dresser is beautiful but I have to admit the ironstone bowl and hydrangeas made my heart flutter. My hydrangeas start out white or pale green, but it’s always about now when they start to turn pink that I think they are the prettiest. Just beautiful perfect in every way. I would like to have this one myself. Love the hydrangeas too! Have to add your photo setting makes this even better. This is so beautifully done that I am now re-thinking the cabinet I bought recently and was going to leave wood. You had suggested using the decals, but until I saw this piece I wasn’t quite sure. Now I’m in love with that look! Yes, this look is exactly what I was picturing on your cabinet! Even these exact IOD transfers (for reference they are the small Memoir transfer (11″ wide by 14″ tall). If the entire design doesn’t fit on your door, you can always eliminate part of the design. Beautiful work and staging ! I LOVE LOVE LOVE that ironstone bowl !!!! Thanks Karen. I got that bowl from one of my blog readers, Skip. It does work really nicely for floral arrangements. It’s all so beautiful. 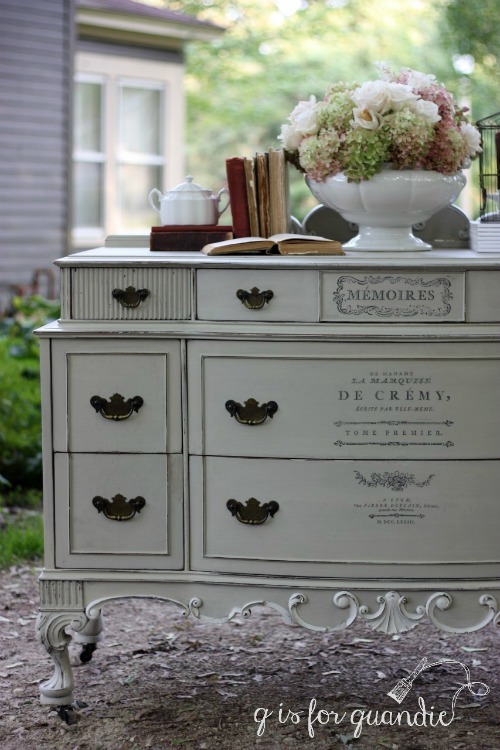 I love the color that you painted the dresser/buffet and the transfer really sets off the styling. 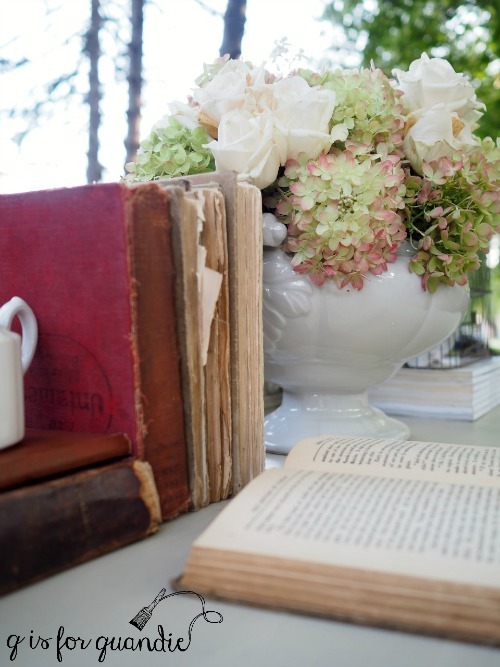 I love the hydrangeas and the rest of the styling, it adds so much to the photo. Thanks for the inspiration. 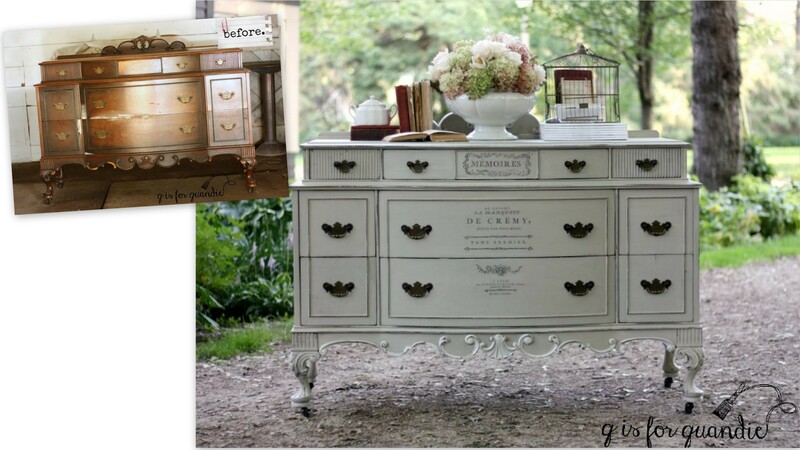 I look at this dresser and youve totally transformed it. It’s so beautiful. Then I look at how you’ve staged it and I just want you to come to my house and stage my entire home. You are so talented. Aw shucks, thank you so much Becky! 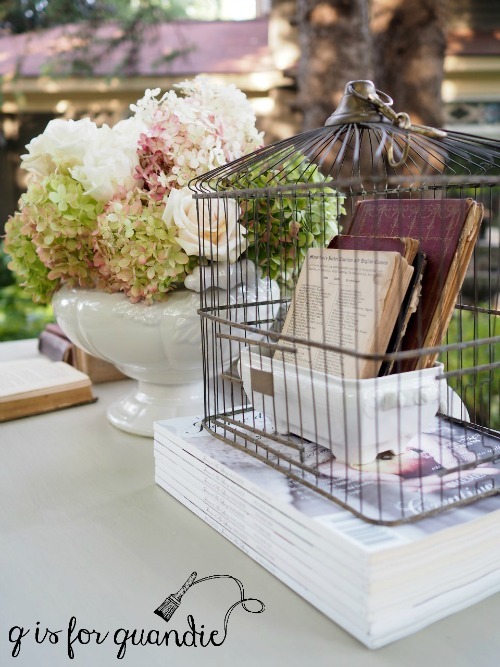 I really do enjoy setting stuff up for photos, it’s one of the most fun parts of blogging about my furniture makeovers! It’s beautiful…….I love it and I do so wish your lived down the road from me in Brisbane Australia. Boy that one really transformed. It looks so much better now. you churn out another piece that is my favorite! I think you are truly the best! I love your staging as well! I went to an auction Friday night and there were so many pieces that were nice but needed some help. With every nice piece I would think of you and how you would love to get your hands on it to make it beautiful! Things were going at nice low prices. I would have loved to take you with me, you would have gotten some real steals! Auctions are dangerous places for me. My arm tends to have a mind of it’s own and want to fly up and bid on everything! 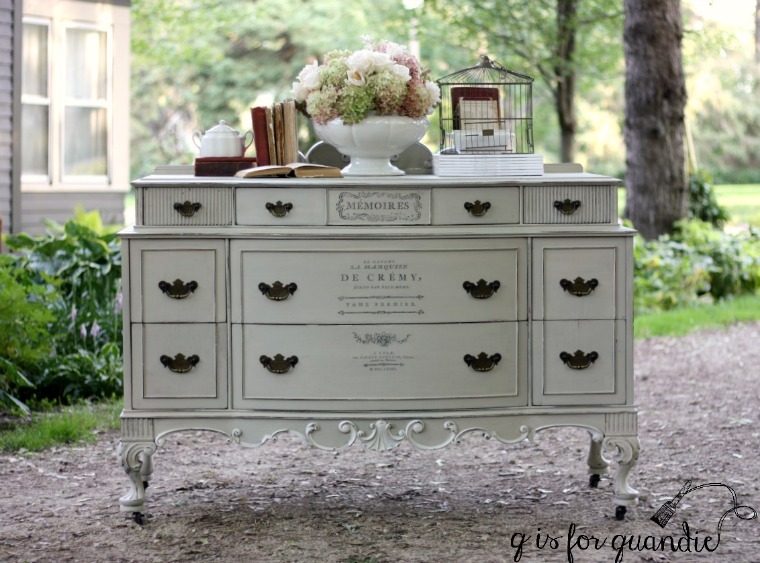 Yep, this dresser would be a lovely companion for the other one you purchased from me! Another fabulous transformation Linda. I’m with you re- the missing trim – you’d never know 😉. Carol, what a crack up. I’m laughing because I just checked out your blog under its new name and found that your most recent post is on how to make your own replacement trim with Fimo! Too funny. I think it might have been a bit more difficult for me to use your technique since my trim was all different shapes and sized (not one uniform pattern). I’m quite sure I wouldn’t have had the patience for that. But yours turned out fabulous! I am simply stunned & in awe of your talent. 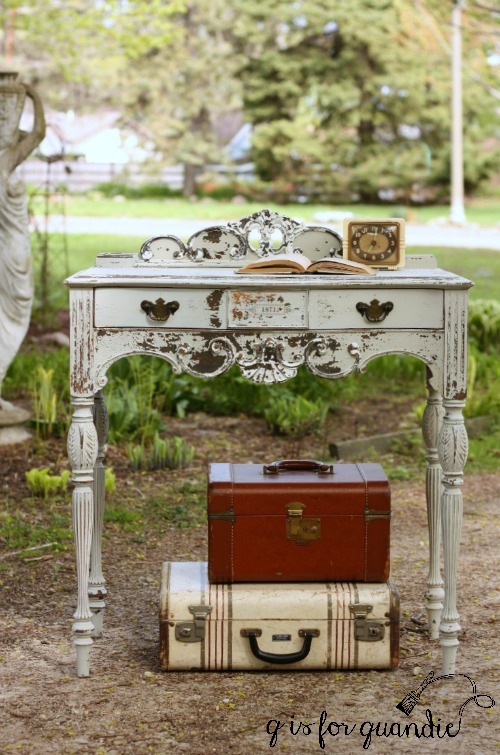 This piece and the other matching pieces are gorgeous and just ooze class. Your work is phenominal and your vision is spot on. These pieces were meant to look like this. They were just waiting for you to come along and transform them into the beauties they are. What an awesome compliment! Thank you so much Christie!